Penguin Computing’s Arctica 4804ip is a cost-effective 48 port 1 GbE Layer 2+ network switch in a compact 1U form factor, suited for Data Center Out-Of-Band (OOB) networks, such as IPMI. The 4804ip provides 48 10-BaseT/100-BaseTX/1000-BaseT ports and 4 1G/10G SFP+ ports. The Arctica 4804ip implements an x86-based control plane for easier integration of Linux and OpenStack automation tools and comes ready to use, pre-installed with Cumulus Rack Management Platform Software. 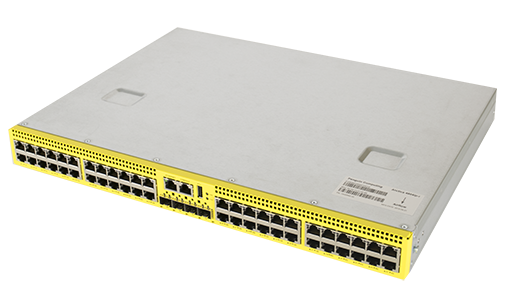 Arctica network switches are white box switches, offering flexibility and customization. Cumulus Rack Management Platform The Cumulus RMP (Rack Management Platform) is a network operating system solution that enables out-of-band management use cases. It provides an open platform for customers and system integrators to use as is or build rack management applications on top. Cumulus RMP shares the same architecture, foundation and user experience as Cumulus® Linux®, with a smaller feature set designed specifically for the out-of-band management needs of the rack. Because Cumulus RMP is a true Linux distribution, it can be automated and managed using the same Linux tools employed to automate and manage switches running Cumulus Linux as well as Linux servers.